Located inside the Turning Stone Resort & Casino in Verona, NY. Valet is available. Line Dancing on Wednesdays at 8pm. Country Karaoke on Thursdays at 9pm. Live bands on Fridays & Saturdays at 10pm. Must be 21+ starting at 10pm. The Oneida's Turning Stone Resort Casino offers world-class golf, gaming, entertainment, and accommodations. Since opening in 1993, Turning Stone has become a destination resort and one of the top five tourist destinations in New York State, hosting more than 4 million visitors a year. Saddle Up! At Tin Rooster, the pig’s sacred, the beer’s cold, and the atmosphere is Country Americana at its finest. Our BBQ features signature flavors that may start a finger lickin’ addiction. But we’ve got more than food – If this barn is a rockin’, come on in. 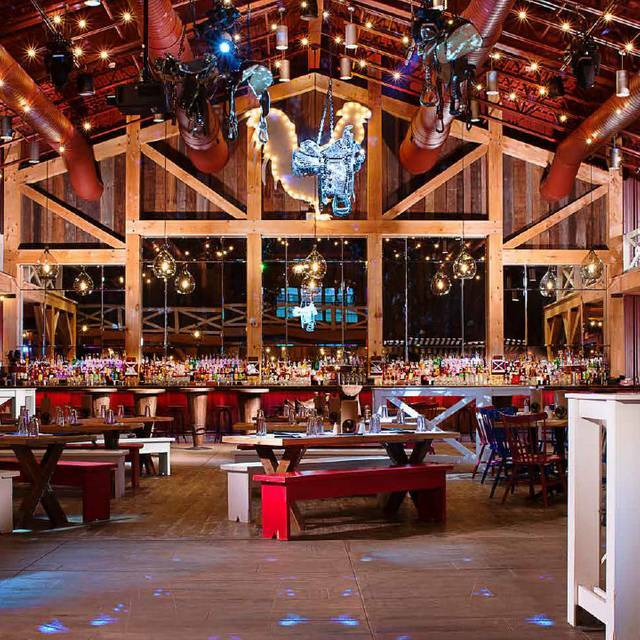 With iced cold beers, country girls dancing, and the best in country music, Tin Rooster is sure to get wild. We were at Tin Rooster early in the evening (5:30pm). It was nice and quiet at that point. My wife and I absolutely LOVED their smoked BBQ foods. The pulled pork and brisket were the best of what the two of us tried. Although a tiny pricey, you get what you pay for. The service was polite and prompt, the food was excellent, and the conditions of everything, including both the men's and women's bathrooms, was immaculate. I couldn't recommend it highly enough. It will be a bit of a splurge spend for most people, but not completely unreasonable - and well worth it. We really appreciate your feedback and 5-star review, Tim! We're happy you enjoyed the pulled pork and brisket and that your service matched exactly what we strive for each day. We hope to see you and your wife again soon! Love the place. Great atmosphere and food was great. Chicken wings and brisket were the best!! Thank you for your review, Lauren! We're happy to hear you enjoyed the chicken wings and brisket and that you liked the atmosphere. We hope to see you again soon! Thank you for your 5-star review, Shaun! We hope to see you again soon! Ok food. Not sure what is in the cornbread, but I didn't care for it. The ribs and chicken were ok. Much better bbq at Dinosaur up the road. Hi Leonard, guest service is important to us and we’re sorry to hear you were disappointed with the cornbread and that your chicken and ribs were anything less than excellent. We hope you’ll give us another try. 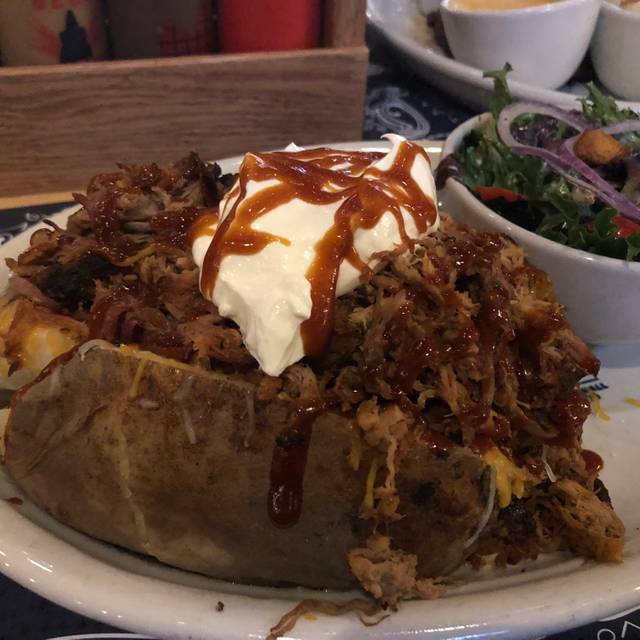 I had the baked potato on the server's recommendation, it was delicious! My date had the brisket/rib combo. It was tough and dry. The server was greater prior to being served, but disappeared once we got our food. the ambience was odd. my only option for noise level was "energetic" what I wanted to choose was too loud. the big open room with multiple conversation makes it difficult to hear one's table mate. Hi Lee, we're glad you enjoyed the baked potato, but we're sorry to hear your date was disappointed with the brisket/rib combination. We appreciate your helpful feedback and have passed it along to our team at Tin Rooster. We hope you'll give us another try. Thank you. Food came out fast and was really good. The Masters was on so we got a break from the cowboy music videos. We really enjoyed this restaurant. The service was excellent, as was the food. We would definitely go back. 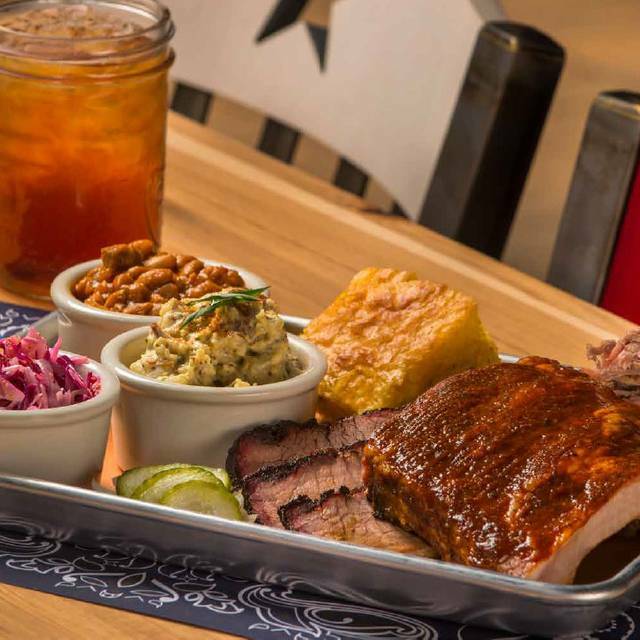 The food is basic barbecue fare but at a good price. It is very loud in the room, so if you are not in a rowdy mood, it would be best to go elsewhere. Waitress was overwhelmed, waited for our bill and checkout. Staff should know how to use the elevator. Food was awesome! Our overall experience was ok. We had a group of 5. The food was good, however a little overpriced for what was served. Our issue was the Server. She was VERY rude. We had to ask for a glass for a drink that was served in a can twice. about 25 minutes later it was finally brought to us and she slammed it down on the table so hard that the entire table shook. She also walked by and pushed her hip into the chair making the person lurch forward. If this was an accident, there was no apology or even look back to see what happened. There were many dirty looks as well. Hi Michelle, guest service is important to us and we’re sorry to hear you were disappointed with the service you received and that your experience was anything less than exceptional. We have passed your feedback along to our team at Tin Rooster and we do hope you’ll give us another try. Must be short staffed. Had to wait a while for food and then longer for the check. Food was great! Unfortunately, what could have been a great experience (food was delicious as always) was marred by horrible service. Our waitress was perfectly pleasant WHEN WE SAW HER, but was the least attentive we’ve ever experienced. Husband ordered the “bottomless ribs” special and she didn’t come back to check on us ONCE the entire meal. Not even drink/beer refills/reorders. Kitchen staff brought the food out. To make matters worse, she was not 10 feet from us the entire time, chatting with the other wait staff. We contemplated going up to the bar to order our next round of drinks, but we simply decided not to give them any more of our money. The Tin Rooster is absolutely solid for food and atmosphere but it’ll be a long time before we return again if ignoring customers is their new brand of service. It was the first time either of us had been to your restaurant. My date had spent many years in Texas, and had experience with good barbecue,. We were seated quickly. The service was prompt and friendly. The foodds was delicious. I especially liked the brisket. Portions were sufficient. It was nice of the chef to inquire of us. It was a nice dinner crowd without being overwhelming. Excellent experience. Food is incredible as always, atmosphere is always great and service is fast and friendly as heck. This is always a huge treat for us and well worth the drive. Fun atmosphere; courteous wait staff; many menu choices; & a good value! Drink service to our table was a little slow, and we had to ask for bbq sauces for the table. Everything else was fine. We love the Tin Rooster! It’s our favorite restaurant at Turning Stone! Waitress and staff were great! Food was not so great. 35 dollar T bone was over seasoned and tough. Ribs were more tough than tender. Cole slaw was delicious! Food was okay just over priced for the quality. The food was very good but the service on the other hand was awful. John the floor manager was excellent !! Waitress was very busy so we only saw her for order and check but everyone else filled the position !! Thanks Again !! BBQ is really good. Great that they have several choices of BBQ sauces. The "cheesy corn" is really good. Cornbread was a little dry. We asked for Sweet Tea Vodka for our iced tea drinks, and were told that, not only did they not have Sweet Tea Vodka, they had never heard of it. We were surprised that a BBQ restaurant, with a bar, had never heard of Sweet Tea vodka. That would NEVER happen at a BBQ restaurant in the (sweet tea) South. Still, it was a very good dining experience. Service was very good. Food as good. I would definitely recommend the Tin Rooster as a good place to eat. I ordered the beer battered haddock one piece of my fish was mostly batter I mentioned it to our waitress, she ask if I wanted another order I stated no, well she must of mentioned to the head Chef Joe he came out and talked with me and stated he would bring me another, the second one came out with two and they were very good Thank You Chef Joe for making it right. Made Reservations. After being seated it took forever to get first drink and by that time we ordered our food. By the time our food arrived I was ready for another drink (Draft Sam Adams) but was not asked until a long time into dinner. The steak was okay, Ive had better. Too many bosses running around mingling and not doing much. Food was not that good this time. And we had issue with tables. Front hostess were rude. Our server I think name was Alley was really good. 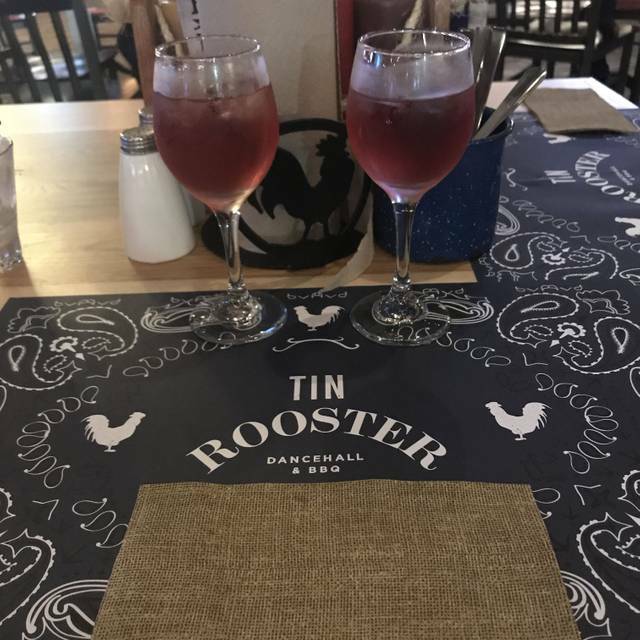 We always enjoy our dining experience at the Tin Rooster. The only change I have ever suggested is swapping the Kielbasa for real Andouille Sausage to make it a true western experience. We had a 6:00 reservation but arrived early and were seated right away. Cute atmosphere. Nice menu. Had the pulled pork sandwich with coleslaw and a chopped salad. Big portions. Food was good. Would go back and also recommend it to friends. Wait staff was excellent. Food delicious. Liked the fun atmosphere. Would recommend to friends and family. Would also come back! THE SERVICE WAS GOOD, NOT HAPPY WITH THE PIECES THEY GIVE WITH FRIED CHICKEN PLATTER FOR $18, TWO DRUM STICKS AND WING AND THEIGH. Sorry but the tin rooster has gone down hill. We use to eat there all the time but they cut their days open and the food isn't what it use to be. The wait staff is to busy chatting with each other then looking out for the customers. Awesome place!! Food.. atmosphere!! Always a fun time !! A great country atmosphere with friendly staff. The food was great and came out to the table in a reasonable amount of time. We waited first in line for the doors to open. We were last to be waited on. He ordered a root beer and she eventually came back to say they were out. He ordered a Yuengling and 35 minutes later after asking the mgr, we got our beer. The appetizers of poppers and wings were hot and delicious. Half the other diners ate and left and after 45 minutes we got the "Dining Week Special" of brisket on potato. The brisket and potato were luke warm and all the toppings were ice cold. It was delicious and the potato was the biggest I've ever seen. Had to be 2#. The peach cobbler was anything but...….. crunch green peaches with cookie crumb topping and ice cream. Very disappointing overall. $54 without the tip. Was so frustrated waiting, I just wanted to leave. The waitress excelled in efficiency for herself. She went from table to table getting drink orders initially and eventually stopped for our order. We went to Tin to enjoy the Restaurant Week menu and it certainly did not disappoint! Staff was very attentive in regards to allergies and requests and even personally reached out to follow up on them and confirm my reservation. The hostesses and bar tenders were wonderful and provided prompt and accommodating service. Our waitress, Brook, handled multiple large parties, along with our table, with ease while still taking the time to check in with us. The food was delicious! We had the smoked wings followed by the melt-in-your-mouth brisket-stuffed baked potato. The portions are quite large so come hungry, and still expect to take something home! I would suggest TR to anyone looking for a casual dinner with great service and a laid back ambiance with the some of the best smoked meats in the area!